An article by Spencer Sunshine about far right involvement in the Occupy movement. But this mainstream-media view tends to gloss over the involvement of right-wing and conspiracist groups in Occupy. In the perception of many participants, the Right’s presence was largely limited to a lone homeless man who paraded antisemitic signs around Zuccotti, which became the basis of a right-wing “smear” campaign. More recently, venture capitalists like Tom Perkins have slandered Occupy, absurdly comparing its attack on wealth inequality to the Nazi persecution of Jews.1 Because of this, many progressives plug their ears when they hear about right-wing groups and Occupy. 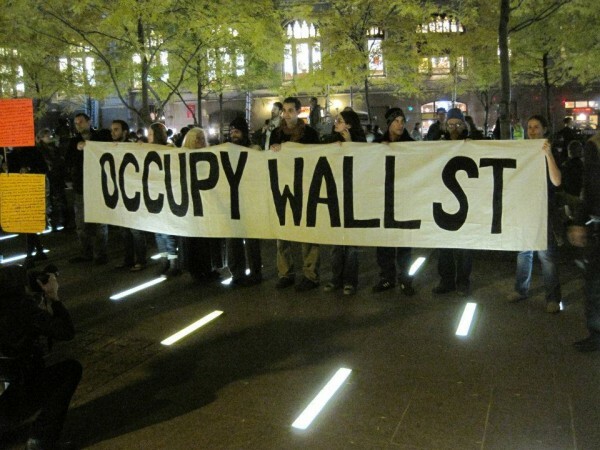 (In this essay, OWS refers to the New York City occupation, while Occupy refers to the movement in general.) Certainly, Occupy was always a largely left-leaning event. But right-wing participation has been the norm rather than the exception within recent left-wing U.S. movements—including the antiglobalization, antiwar, environmental, and animal rights movements—and Occupy was no exception.2 Right-wing groups inserted their narrative about the Federal Reserve into the movement’s visible politics; used Occupy’s open-ended structure to disseminate conspiracy theories (antisemitic and otherwise) and White nationalism; promoted unfettered capitalism; and gained experience, skills, and political confidence as organizers in a mass movement that, on the whole, allowed their participation. Ideally, none of these things should have happened. Advocates for social justice need to assess the motivations, extent, and substance of right-wing participation in Occupy—just as has been done with past movements. Despite the painful feelings it might evoke, it is time for this process to start. The original call for OWS from Adbusters magazine said the demonstrators themselves would decide on the “one demand” of the occupation, but this never materialized. Instead, the eminently populist slogan “We are the 99%” became their rallying cry. The one percent—often assumed to be those whose household incomes were over $500,000—was obviously associated with “Wall Street,” the focus of the demonstration.3 But many people with that kind of income were not associated with Wall Street at all. And, in any case, what exactly was Wall Street: the New York Stock Exchange? Banks? Bankers? Global corporations? The Federal Reserve? And who were the one percent: Crony capitalists specifically? Capitalists generally? The rich? Political elites? The Bilderberg Group? The Rothschild family? Jews? Or—as one popular conspiracy theorist had it—our reptilian overlords? Particularly at the beginning, Occupy embraced everyone, just as a number of organizers intended.4 If the goal was to unite “the 99%” against a tiny elite, after all, didn’t that require a Left-Right alliance? Many on the Right openly called for such an alliance, though the agenda they proposed usually offered little that the Left could get behind. But in addition to this general, populist appeal for uniting the people against the elites, there was one specific piece of common ground. While few right-wing actors see capitalism as a system to be abolished, many are harsh critics of finance capital, especially in its international form. This critique unites antisemites, who believe that Jews run Wall Street; libertarian “free marketers,” who see the Federal Reserve as their enemy; and advocates of “producerist” narratives, who want “productive national capital” (such as manufacturing and agriculture) to be cleaved from “international finance capital” (the global banking system and free-trade agreements). Finance has become a larger part of the U.S. economy, and increasingly international, in the last few decades. As an industry, it produces comparatively few jobs, and it functions globally as one of the pillars of neoliberalism, exacerbating economic inequality. While economic downturns are an intrinsic feature of capitalism itself, it was the largely unregulated behavior of banks that caused the most recent crisis. Occupy was just one of many global demonstrations against austerity economics that have been populist in approach and politically amorphous, and, especially in Europe, these have a particular appeal to the Far Right. In Occupy the most common demand of the various right-wing and conspiracy groups—especially those who openly called for Left-Right unity—was for the abolition of the Federal Reserve. Whether this is an issue actually shared by the Left, or just an attempt to get the Left to support right-wing policies, is another question. The Right’s participation was far from limited to a handful of antisemites, but it is nonetheless true that Occupy’s attacks on finance capital attracted many of them, since such attacks were easily integrated into their fantasies of Jews controlling the banking industry. (Rather than explicitly naming Jews as the villain, antisemites often instead demonize a subgroup that they identify as Jewish, such as Zionists, international bankers, neoconservatives, “the Frankfurt School”—or Wall Street.) Adbusters, the magazine that initially sparked OWS, has an especially troublesome past. Its editor and co-founder, Kalle Lasn, published an article in 2004 criticizing neoconservatives by invoking numerous antisemitic narratives. The article included a list of prominent neoconservatives with marks next to the Jewish names. Responding to widespread criticism, Lasn denied that he was antisemitic but showed no understanding of why the narrative of the article was offensive. More recently, the magazine has published articles by antisemitic writer and musician Gilad Atzmon.5 This certainly raises the question of whether Adbusters’s choice of Wall Street as a target may have been shaped by narratives influenced by antisemitism. Some mainstream right-wing media attempted to discredit OWS as being primarily antisemitic from the outset. The catalyst was an October 2011 article in Commentary by Abe Greenwald. Relying on two antisemitic videos from Zuccotti—one of a homeless man who appeared daily with antisemitic signs, and the other of a random participant—Greenwald claimed that OWS “protesters are literally boasting of their Nazi credentials” and that the “point of Occupy Wall Street is to scapegoat fellow Americans. And wherever political scapegoating takes place, anti-Semitism is sure to follow.” In mid-October, the Emergency Committee for Israel released a broadcast ad implying that the OWS demonstrations were overwhelmingly antisemitic, and demanding that President Obama repudiate the incidents. Its evidence consisted entirely of the two videos.6 All of this created such a media uproar that more mainstream groups weighed in. The Anti-Defamation League’s Abe Foxman said that there was “no evidence that these anti-Semitic conspiracy theories are representative of the larger movement or that they are gaining traction with other participants.”7 Journalist Jonathan Chait summarized the situation by writing that the “ratio of outraged published reports or commentaries about anti-Semites at OWS to actual anti-Semites at OWS is probably about ten to one.” Despite this, the Zuccotti General Assembly (GA) never passed a resolution specifically condemning antisemitism in its own ranks. (The GAs were the directly democratic gatherings where everyone could speak, and where OWS decisions were made.) In November 2011, the GA did pass a resolution condemning antisemitism in the abstract, though it involved an incident unconnected to Occupy.8 The result was that many Occupy protestors on the Left felt that they were being unfairly “smeared” as antisemites by the mainstream Right in an attempt to discredit the movement as a whole, and, furthermore, that these claims were without merit.9 This fear of subversion created an atmosphere of denial and a general consensus that there was no involvement in Occupy by those further to the Right than Ron Paul. Right-wing and conspiracist participation in Occupy was nonetheless real, and it involved more than 20 groups, prominent figures, and media outlets. These included Ron Paul supporters, Alex Jones, Oath Keepers, David Icke, We Are Change, Tea Party members, National-Anarchists, Attack the System, the Pacifica Forum, American Free Press, LaRouchites, Counter-Currents, the American Freedom Party, American Front, David Duke, the American Nazi Party, White Revolution, and others. (A detailed account of their participation is available separately in my essay, “Twenty on the Right in Occupy.”)10 Their involvement included attending planning meetings, taking part in the encampments, making appeals directed to the Occupiers, and co-opting online resources. They fell into four overlapping categories: anti-Federal Reserve activists, conspiracy theorists, antisemites, and White nationalists/neo Nazis. One of Paul’s central goals is to abolish the Federal Reserve (commonly known as “the Fed”), and he has popularized the slogan “End the Fed!” He believes that it fosters “crony capitalism”—big business working hand-in-hand with the federal government—and facilitates foreign wars. Abolishing the Fed will, he believes, both reduce U.S. militarism and make the federal social safety net impossible to sustain. In Paul’s utopian free market, the old, sick, and disabled would be left to suffer and die unless their families or others volunteered to help. Paul also opposes abortion and Social Security, and he has a long history of accepting support from and dialoguing with White nationalists.11 The ambiguity of Occupy attracted a substantial number of Paul’s supporters, who in turn attracted a fair amount of media coverage for themselves. They gained general traction within Occupy because of their objection to the Federal Reserve’s bailout of the major banks after the financial collapse, and sometimes focused on its role in the subprime mortgage crisis. Counterintuitively for many, the lesson of the crisis for Paulists was the need for less—not more—federal involvement in the banking system. Many others who wanted to abolish the Federal Reserve also became involved in Occupy; most supported Paul’s candidacy. Alex Jones, one of the most popular U.S. conspiracy theorists (although not a consistent supporter of Occupy), attempted to crash the movement by calling for a national event on Oct. 6, 2011, to “Occupy the Fed.” Jones said that, contrary to media portrayals of Occupy as left-leaning, “The people on the ground … understand the Federal Reserve is the central organization empowering this world government system. This is a revolt against banker occupation.”12 At the same time, the Oath Keepers organization, in concert with Jones and others, concocted a national push to insert “End the Fed!” rhetoric into Occupy under a call to “Occupy the Occupation!” (Oath Keepers, which holds armed marches, recruits current and former military and law enforcement employees who swear to “uphold the Constitution,” and is driven by conspiracies about the coming One World Government.) It also helped establish an encampment in Occupy Los Angeles and attempted to recruit there.13 Another Fed critic was David Icke, known for his metaconspiracy theory that the global elite are descendants of reptilian aliens who seek to enslave humanity—a story that weaves in classic antisemitic narratives. His “Essential Knowledge For A Wall Street Protestor” video, which promotes anti-Federal Reserve and related economic conspiracies, has about 350,000 views. He also made an hour-long “ad-lib documentary” in Zuccotti Park just after the encampment was evicted by authorities.14 Icke’s followers were active in both U.S. and U.K. Occupations. Other conspiracists who worked in Occupy include We Are Change (WAC), an international 9/11 “Truther” group. Luke Rudkowski, the group’s founder, is a prolific video blogger and is well-known for his paparazzi-style interviews. On site at OWS from the first day, he did extensive video coverage at Zuccotti Park and is also featured in David Icke’s videos. Members of WAC New York City, a splinter faction, were also active in OWS, including Danny Panzella, a Tea Party activist who ran for state office in 2010. Even before OWS, Panzella organized demonstrations against the downtown Manhattan Federal Reserve, and he worked hard to refocus Occupy on an “End the Fed!” agenda. He appeared on the Fox News show Freedom Watch, in one of a number of the show’s broadcasts that encouraged libertarians to attend Occupy events.15 Other members of the group who worked with OWS included Craig FitzGerald, a “National-Anarchist” who promotes Holocaust denial and endorses White separatism. It is a mistake to view these right-wing groups and people as “infiltrating” Occupy, since in some cases they supported and helped organize it even before it started. Others were simply participating in a demonstration that loudly proclaimed that it was open to everyone and refused to define even its most basic concepts or demands. Yet some on the Right did view their work as intentional co-optation. This is an intrinsic problem with the “franchise activism” model, or the practice of setting up a name and format that anyone can adopt and act under. While it allows for ease of replication and flexibility in action—one of Occupy’s great strengths—it also allows a variety of political visions to be pursued under its banner. For example, almost no mechanisms are available to deem the “imposter” Facebook page as illegitimate in relation to the “real” one. In addition, for decades, elements of the Far Right have been trying to concoct a strategy for a decentralized White nationalist movement.29 One group tried to think up how it could set up a White nationalist version of Occupy, while another praised the open organizational structure as a boon for spreading its ideas.30The point it is not so much that the Left was significantly damaged by the Right’s presence in Occupy—though its presence did open the movement up to attacks in the mainstream media, which wasted the time and effort of organizers while turning off potential supporters. The deeper problem is that right-wing groups benefited from the Left’s willingness to give them a stage to speak from and an audience to recruit from. Many Leftists argue that mass organizing should occur in a Popular Front style, with the critique of capitalism as a system being the core politic and specific, popular grievances merely the focus of mobilizations—egregious examples to rally people around but not the actual cause. This organizing style requires either an ideologically cohesive coalition or a specific group behind the mobilization, controlling the messaging and serving as a gatekeeper against right-wing participation. After the August 2007 crisis, however, the traditional U.S. Left was unable to lead a popular protest movement in this format, and it took OWS nearly four years to get off the ground using digital-age organizing, self-selected organizers, and ambiguous politics. It is unlikely that organizing along the former model would have ever succeeded, or that mainstream liberal pundits, who were instrumental in popularizing OWS, would have supported a more traditional, centrally organized leftist mobilization. The ambiguity of OWS politics, which let people hang their own hats on it, made Occupy possible—but also became a double-edged sword, since what helped the Left also enabled the Right. As a result, the involvement of right-wing groups in Occupy raises questions about the dilemma of creating a movement that is open to “everyone” but must exclude certain elements if it is to avoid becoming a forum for right-wing populist protest. The basic format of the demonstrations—a populist attack on finance capital with ambiguous formulations—harmonized quite well with the political vocabulary and framework of the Right and conspiracy theorists. Are there any practical steps, then, that activists on the Left can take to minimize participation by the Right? The administrators at the OccupyWallSt.org forum, the main online location of internal discussions, took one small step after they were deluged by conspiracy theorists and Far Right propagandists. In October 2011, they banned anyone who posted about Icke, LaRouche, Duke, or Jones.31 A more proactive first step would be to endorse an anti-oppression platform at the very start, such as the one created at Occupy Boston. Unlike the relatively vague statement from Zuccotti, Boston’s statement explicitly named the types of oppression that it opposed, including White supremacy, patriarchy, ageism, homophobia, transphobia, anti-Arab sentiment, Islamophobia, and anti-Jewish sentiment.32 A member of the Hoosier Anti-Racist Movement pointed out that if such a platform had been in place in Occupy Indianapolis, when racist sentiments were expressed towards people of color, there would have been an existing agreement to point to—and a basis for asking the larger group to intervene—rather than relying on nonexistent cooperation from the majority of the largely White participants. The HARM member also said that if racists had been confronted and expelled from the physical occupation, they likely would not have posted a positive video of their experience, felt welcome to continue to participate in the group’s social media, or written about their warm reception.33 Not taking a proactive stance against antisemitism at Zuccotti led to significant bad press and much time and energy invested—often by Jewish participants—in putting out fires. In truth, even if such measures are enacted, right-wing involvement in popular demonstrations that have traditionally been the province of the Left is likely to continue. The mass-based left-wing parties and unions in the West are rapidly losing their remaining influence as state communism has collapsed in Eastern Europe; Keynesianism and social democracy are in eclipse; and neo-liberalism illuminates the world with its triumphant calamity. The countries that remain in opposition are a handful of creaking authoritarian regimes and religious theocracies in the Middle East and Asia, along with a few left-leaning democracies in Latin America that, at least for activists in the West, have not generated the same inspiration that past revolutionary governments did. On the ground, most successful mass protest movements of the last decade and a half in the West, North Africa, and the Middle East have been leaderless and decentralized. They have also had vaguer and vaguer goals. The Right—with its criticisms of finance capital and financial elites—will continue to try to profit politically from economic crises. In the last few years, fascists have been able to do this in Greece, Bulgaria, and, most recently, Ukraine—where they have been the most prominent faction in the weeks of street-fighting in Kiev. Advocates for social justice would do well to have a plan to deal with them. 1. Tom Perkins, “Progressive Kristallnacht Coming?,” Wall Street Journal (letters), Jan. 24, 2014, http://online.wsj.com/news/articles/SB10001424052702304549504579316913982034286. 2. See, for example, Chip Berlet, “Right Woos Left,” originally Dec. 20, 1990 (revised with corrections), www.publiceye.org/rightwoo/rwooz9.html.The anti-globalization movement is analyzed in Anti-Fascist Forum, ed., My Enemy’s Enemy, 3rd ed. (Kersplebedeb, 2003). 3. The figure is from Phil Izzo, “What Percent Are You?,” Oct. 19, 2011, Wall Street Journal blogs, http://blogs.wsj.com/economics/2011/10/19/what-percent-are-you/. 4. On Aug. 12, 2011, Adbusters’s Micah White said they should “reach out to the Tea Party, too. This is a moment for all of America.” In OWS planning meetings, Alexa O’Brien, the U.S. Day of Rage organizer, said, “We need to appeal to the right as well as the left.” Quoted in Nathan Schneider, Thank You, Anarchy (University of California Press, 2013), 15, 4. 6. Abe Greenwald, “Occupy Wall Street Has an Anti-Semitism Problem,” Commentary, Oct. 11, 2011, www.commentarymagazine.com/2011/10/11/occupy-wall-street-has-an-anti-semitism-problem/; Emergency Committee for Israel, “Hate at Occupy Wall Street,” Oct. 13, 2011, www.committeeforisrael.com/hate_at_occupy_wall_street. 7. “ADL Calls On ‘Occupy Wall Street’ Organizers To Condemn Anti-Semitic Remarks Made At Rallies” (press release), Oct. 17, 2011, http://archive.adl.org/presrele/asus_12/6138_12.html. 8. Jonathan Chait, “Anti-Semites! With Signs!,” New York, Oct. 18, 2011, http://nymag.com/daily/intelligencer/2011/10/anti-semites_with_signs.html; “OWS Official Statement Against Anti-Semitism,” Nov. 13, 2011, http://interoccupy.net/occupyjudaism/ows-official-statement-against-anti-semitism. 9. “A Statement Against Smears” (press release), Nov. 1, 2011, http://jewishleadersagainstsmears.wordpress.com/. 10. Spencer Sunshine, “20 on the Right in Occupy,” www.politicalresearch.org/20-on-the-right-in-occupy. 11. Rachel Tabachnick and Frank L. Cocozzelli, “Nullification, Neo-Confederates, and the Revenge of the Old Right,” The Public Eye (Fall 2013), 2–8, www.politicalresearch.org/nullification-neo-confederates-and-the-revenge-of-the-old-right. 12. “The Revolution Against the Federal Reserve Starts Now,” Oct. 6, 2011, www.youtube.com/watch?v=R0AJy4pJUE8. 13. Members of End the Fed, Oath Keepers, and We Are Change started a “Liberty Encampment” at Occupy LA and called for others to join them. See “End the Fed at Occupy Los Angeles,” Oct. 9, 2011, http://occupythefednow.com/2011/10/09/end-the-fed-at-occupy-los-angeles;” “OATH KEEPERS (and Volunteers From Other Liberty Orgs) To Occupy The Occupation!,” Oct. 5, 2011, http://oathkeepers.org/oath/2011/10/05/oath-keepers-and-the-wayseers-to-occupy-the-occupation. 14. “David Icke – Essential Knowledge For A Wall Street Protestor,” Oct. 21, 2011, www.youtube.com/watch?v=gV9A2IGShuk; “David Icke’s ‘ad lib’ documentary at Occupy Wall Street,” Jan. 6, 2012, www.youtube.com/watch?v=99nvx3m2fbQ. 15. “Danny Panzella on Freedom Watch w/ Judge Napolitano,” Oct. 4, 2011, www.youtube.com/watch?v=20_NRdXTD4k. 16. “Power to the Neighborhoods (A Message to ‘Occupy Wall Street’),” Oct. 21, 2011, www.youtube.com/watch?v=4FwpQiyF94U. 18. Dave Gahary promoted the upcoming demonstration in “‘Nautilus’ & the Chance for a U.S. Revolution,” American Free Press, Sep. 19/26, 2011. Pro-Occupy articles ran in the paper on a weekly basis until after Zuccotti was evacuated. See, for example, Michael Collins Piper’s cover story: “Left–Right Unite: Wall Street, Federal Reserve, Big Media Targeted,” American Free Press, Oct. 31, 2011, which features a photo of a staff member burning “Federal Reserve notes” (i.e., U.S. currency) at a Washington, D.C., Occupy event. 19. “Diane Sare Reports from ‘Occupy Wall Street’ Rally,” Aug. 4, 2011, http://larouchepac.com/node/18979; Schneider, Thank You, Anarchy, 5, 16. 20. “‘Occupy Wall Street’ Mass-Strike Process Embracing Glass-Steagall” (press release), Executive Intelligence Review, Oct. 7, 2011, www.larouchepub.com/pr/2011/111007occupy_wall_st.html. 21. Greg Johnson, “Occupy Wall Street: Big Money & No Ideas,” Oct. 11, 2011, www.counter-currents.com/2011/10/counter-currents-matching-grant-updateoccupy-wall-street-big-money-no-ideas/. 22. “Occupy Zionist Wall Street by David Duke,” Oct. 20, 2011, www.youtube.com/watch?v=xKy22KsxX9k; David Duke, forum post #60, Nov. 2, 2011, www.stormfront.org/forum/t842071-6/. 23. Matt Parrott, “Occupy Indianapolis Roundup,” Oct. 14, 2011, www.counter-currents.com/2011/10/video-from-the-front-lines-occupy-indianapolis-roundup/, . 24. Tristania, “Experiences at Occupy Indianapolis,” Oct. 11, 2011, www.stormfront.org/forum/t837879/#post9639571; and “Re: Experiences at Indianapolis,” Oct. 14, 2011, www.stormfront.org/forum/t837879-3/#post9646591. 25. “HARM Withdraws Support for Occupy Indianapolis,” Jan. 19, 2012, https://web.archive.org/web/20120124170722/http://indianaantifa.wordpress.com/2012/01/19/harm-withdraws-support-for-occupy-indianapolis/; personal communication with “Telly,” a founding member of HARM. 26. “ANP Report for Oct. 16, 2011,” http://anp14.com/news/archives.php?report_date=2011-10-16. 27. Billy Roper, “Occupy Pennsylvania Avenue!,” Oct. 12, 2011, https://web.archive.org/web/20111231041640/http://Whiterevolution.com/?p=2930. 28. “Occupy Phoenix with AR-15’s,” Oct. 20, 2011, www.youtube.com/watch?v=xkM7cdMgcEc; “Capital Hell Commune,” Oct. 30, 2011, http://pugetsoundanarchists.org/node/1052. Regarding liberal protestors defending the right of neo-Nazis to remain, see “Occupy Seattle General Assembly,” Occupy Seattle, Nov. 6, 2011, http://occupyseattle.org/?p=376; and “The National Socialist Movement scum show up armed to counter protest #occupyphoenix,” Fires Never Extinguished, Oct. 15, 2011, http://firesneverextinguished.blogspot.com/2011/10/national-socialist-movement-scum-show.html. 29. For example, see Spencer Sunshine, “Rebranding Fascism: National-Anarchists,” The Public Eye (Winter 2008) 1, 12–19, www.politicalresearch.org/rebranding-fascism-national-anarchists. One source reported that Louis Beam, the legendary White nationalist advocate of “leaderless resistance,” had endorsed Occupy. See Alexander Mezentsev’s comment (#10), Nov. 5, 2011, www.counter-currents.com/2011/10/leader-ful-resistance-the-predicament-of-the-right-today/. 31. OccupyForum, Oct. 30, 2011, https://web.archive.org/web/20111031181619/http://occupywallst.org/forum/moderating-policies-will-be-reposted-somewhere-pro/. 32. “Internal Solidarity Statement,” Oct. 4, 2011, www.occupyboston.org/2011/10/04/internal-solidarity-statement. 33. Author interview with “Telly,” Nov. 2013.
there is a similar problem at the moment in Germany with a series of "Peace Vigils" organised by a FED-obsessed cultish weirdo and with a strong participation by conspiracy wingnuts, some Fascists, a lot of confused people but also some leftists ... it doesn't look like that it becomes a self-sustaining mass movement but it causes some damage, especially by attracting some inexperienced people who simply want to do something "against the war"